As I set out Saturday morning the omens were good. Two magpies flew off into the distance as my car approached and, as it turned out, that was a portent for the afternoon at St James; the Magpies barely putting in an appearance. 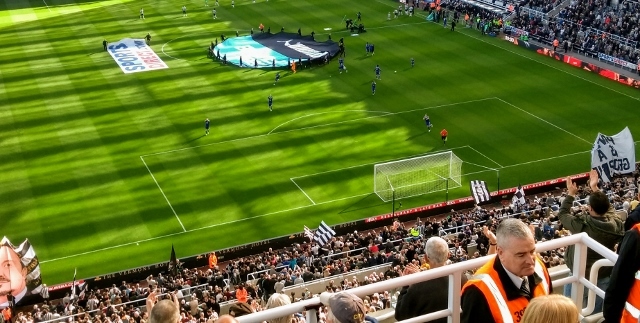 The visit to Newcastle is one of my favourite trips of the season, a mammoth stadium just 200 metres outside the City Centre. The view is not great as an away fan as you sit up with gods, but if nothing else it is a rare if not unique experience. Being so high up, and behind the goal, the match plays out in front of you like a game of chess, and the chess grandmasters were all playing for The Foxes. So, who were the grandmasters? Papy Mendy was immense again, his work rate, his passing, exceptional. He was all over the pitch breaking up play, passing the ball accurately, and generally setting the tempo for City. He is now fulfilling the promise and potential that Claudio saw in him. If Mendy, with Ndidi, is the engine room of the team then the creativity comes from James Maddison. His passing accuracy, his ability to turn and switch play, is a joy to behold; his set piece delivery is another excellent attribute he has in his locker. Gareth Southgate watching in the crowd would not have been disappointed. The third of the trio of grandmasters on show was Maguire, barely putting a foot wrong he was steady and strong in defence, bringing the ball forward and crowned his display with a thunderous header; so dominant in either box and reminiscent of his efforts in the World Cup. On a fine afternoon City kicked off attacking the Gallowgate end of the stadium. They were quickly on the front foot and into their passing game although the best chances in the opening minutes fell to Newcastle. Firstly, Perez tried to put Joselu in before Perez himself had a chance before Ndidi cleared the danger. On 10 minutes some fine interchange of passing by City put Ricardo in but Dubravka saved at the foot of his post and put the ball behind for a corner. Although City were controlling the match, the Magpies had another chance when Diame headed just wide when in a great position. City pressed forward and won a series of corners the third of which led to City’s opener. 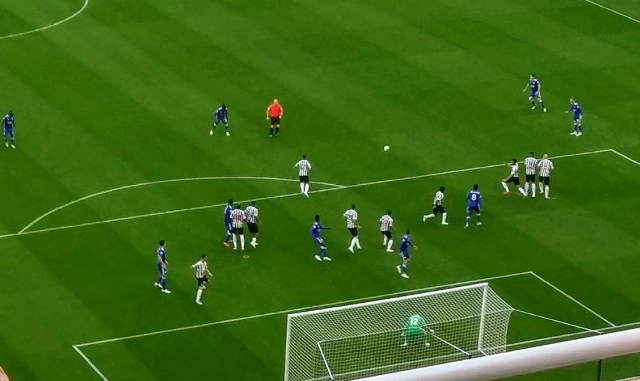 The corner fell eventually to Maguire who shot and the ball was handled above his head by Yedlin. 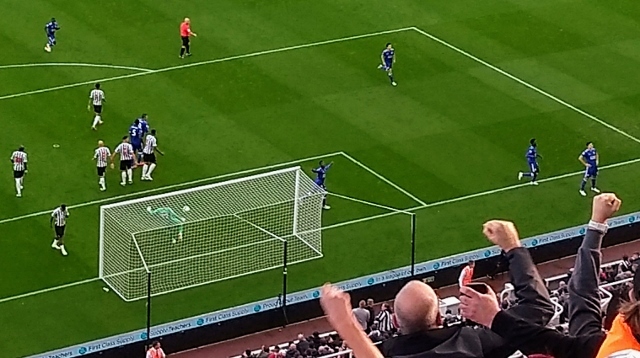 Newcastle protested at length but Vardy kept his calm and slotted the ball in the corner; the score after thirty minutes no less than City deserved. City maintained control and were comfortable as half time came although the feeling was they needed another goal. 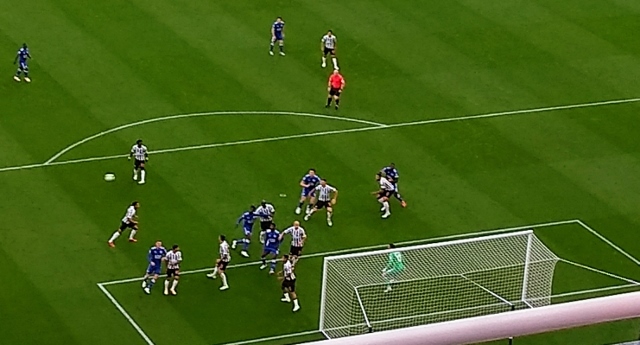 The Magpies had mustered one shot on target, a shot from inside his own half from Shelvey who tried to catch Schmeichel off his line. The second half started in the same fashion but on 49 minutes Perez fell into Maguire and went down in the box. Although Perez seemed to be the aggressor, the player and the crowd were in uproar but the referee Simon Hooper ignored the protestations. The referee had a good game keeping control and playing the advantage when at all possible. Then followed a volley by Maguire from the edge of the opponent’s box which he made a real mess of, so much so that the ball dropped to himself and he had a second attempt. This time the ball went wide of the far post although never really threatening the goal. Shelvey was dishing out some tough tackles and Vardy was a victim as he attempted to clear the ball from a Newcastle attack. As a result, Vardy needed lengthy treatment and never really recovered before being substituted for Albrighton in the 75th minute. Two minutes earlier City had gone two goals up with the accurate Maddison corner and the header by Maguire. For the rest of the match it was City well on top and Newcastle looking increasingly woeful. 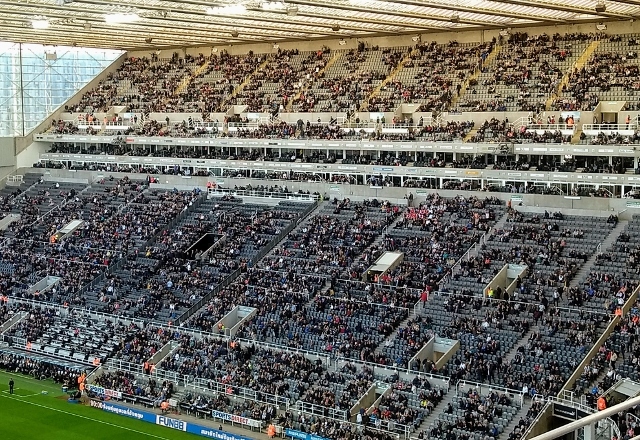 Mike Ashley was in attendance at a Newcastle United home game for the first time since May 2017. It is hoped he is his thick skinned because the abusive chants aimed at him by the Geordie fans was intense; although there is a feeling it does not concern him. News before the match was that former Chelsea and Manchester United Chief Executive, Peter Kenyon, is trying to put a consortium together to buy the Club. There is not much time for sympathy for others in football, but it would be really welcome for the good times to return to Newcastle for the sake of the Geordie fans who deserve better than this dreadful team. The stadium was quiet today generally but when they are stirred it is a fearful noise they create. Nearly 50,000 turned out again but a large number had gone before the end. As bad as Newcastle were, City were good but they will have much harder days than this. The match was a jog in the park for them if not a stroll. The control they exerted today as they did in the second half against Huddersfield, will have done wonders for their confidence. Both opponents in the bottom three of the Premier League, but you can only beat what is put in front of you and City have done this when they have failed to do so against poor opposition in the past. This game was checkmate long before the end with City holding all the major pieces. Tonight, they sit seventh in the table, a promising start.